A consumer proposal is one way to settle debt but it’s not the only option. Not everyone faces the exact same debt problems and there is no one-size fits all approach. The only debt settlement legislation in Canada that has been introduced by the government is through a consumer proposal. To help you choose which service makes the most sense for you, we compare the costs, pros and cons of each debt relief option with a consumer proposal. One of the biggest differences across most debt settlement programs is the cost. In almost all cases a consumer proposal will provide you with the lowest monthly payment. Here is a typical example based on $40,000 in unsecured debts. You can calculate what your potential costs might be with our consumer proposal calculator. 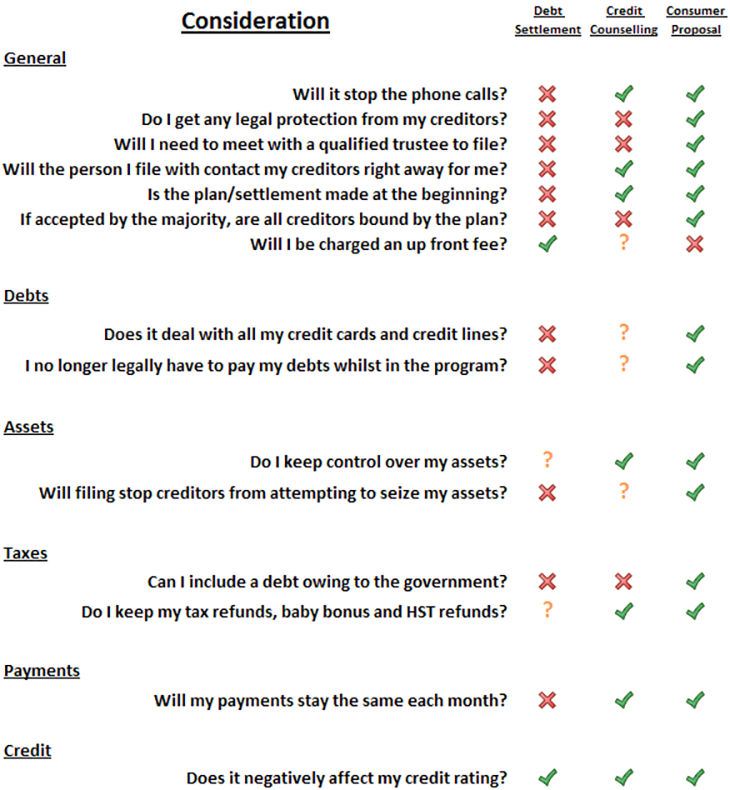 To compare 3 common debt settlement alternatives side by side, see our comparison chart at the bottom of this page. A consumer proposal is often contrasted with a program provided by credit counselling agencies known as a debt management plan. A debt management program is plan to repay all of your debt over a period of time. A DMP is not a debt settlement program. Instead it is a debt repayment plan. While your payments will be less than they are today, they will be more than in a consumer proposal because in a debt management program you are required to back 100% of your debts. In a debt management plan you must repay your debts in full. In a proposal you settle your debts for less than you owe, generally between 25% and 50% of the amount owing. A consumer proposal is prepared by a trustee licensed by the federal government. A debt management plan is prepared by a credit counsellor, who has no government license. Credit counsellors are self-accredited through self-managed associations. A proposal settles all unsecured debts. Not all creditors will participate in a debt management plan. Canada Revenue Agency and most payday loan companies are two common examples of creditors that will not agree to a program through a credit counsellor. A proposal, once accepted is binding on your creditors. A debt management plan is voluntary. Some creditors may agree, others may not. Under the Bankruptcy & Insolvency Act, a proposal provides legal protection from creditor actions. A debt management plan does not. Creditors may agree to the terms of a DMP, but there is nothing legally preventing them from changing their mind part way through the process. In both procedures your credit rating becomes an R7. A consumer proposal remains on your credit report for 3 years after your final payment; a debt management plan is purged two years after your final payment. Because your payments under a consumer debt proposal are much lower, you can begin to rebuild savings much sooner. Not everyone advertising consumer proposals on the web is licensed to file proposals. Since a consumer proposal is a government program, only Licensed Insolvency Trustees are regulated to file proposals. Unfortunately that means that much of the information out there about proposals is misleading and sometime outright deceiving. Dealing with the wrong company can be quite costly. This is why we always recommend talking with a Licensed Insolvency Trustee, even if just for a second opinion. Informal debt settlement is performed by unlicensed debt consultants. They charge a monthly fee, payable under a contract they ask you to sign to ‘work for you not your creditors’. They don’t work for you. They collect information and paperwork, charge you a monthly fee then in most cases refer you to a trustee to file a consumer proposal. You do not receive protection from your creditors. Creditors can still sue you, garnish your wages or seize assets. You will likely be required to sign a contract requiring you to make monthly payments before an offer is even presented to your creditors. Collection calls can, and will, continue while you are making your monthly payments to the consultant because they have not received any agreement from your creditors. Some (not all) debt settlement companies don’t have offices in Canada to meet in person. They may offer to work with you over the phone only. You never need to pay to see a Licensed Insolvency Trustee. If anyone says they ‘work for you and not the creditors’ you should be wary. Ask for their credentials and don’t make any payments until your proposal has been filed with the government. If you have reasonable access to credit, or have equity in your home or another asset, you may be able to take out a second loan or mortgage to pay off your debts. A debt consolidation loan is a new loan you use to repay your old debt. It is important to note that a debt consolidation loan does not reduce your total debt. If you consolidated $30,000 in credit card debt, you end up with a $30,000 home equity loan or second mortgage. Your total debt has not decreased. Both a proposal and debt consolidation loan allow you to consolidate several debts into one payment. A proposal has a lower monthly payment because it is interest free. A debt consolidation loan still carries interest and the rate you are eligible to receive will depend on your credit rating. A concern with a secured debt consolidation loan is the risk that you may lose your home. If your debts are more than you can reasonably repay even when rolled into your mortgage, debt consolidation may not be the best choice. If you become unable to make your mortgage payments your lender will likely take action to recover their loan by foreclosing on your house. A second mortgage is not be a good solution if it does not deal with all of your debt problems. If you have debts that cannot be combined into your mortgage, or you continue to use your credit cards and accumulate new debts, you could find yourself owing more than you started with. The chart below compares the differences between the three services offered. Before deciding which solution will work best for you, review your options carefully.They can help you compare your alternatives to eliminating your debt. All our Consumer Proposal Administrators offer a free no-obligation consultation. You can simply ask a question and if a consumer proposal sounds like it will work for you, book a free appointment with your local trustee.